Dissipative Structure and Weak Turbulence provides an understanding of the emergence and evolution of structures in macroscopic systems. 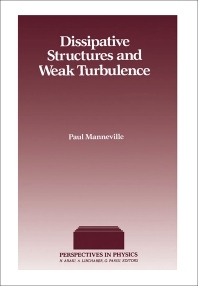 This book discusses the emergence of dissipative structures. Organized into 10 chapters, this book begins with an overview of the stability of a fluid layer with potentially unstable density stratification in the field of gravity. This text then explains the theoretical description of the dynamics of a given system at a formal level. Other chapters consider several examples of how such simplified models can be derived, complicating the picture progressively to account for other phenomena. This book discusses as well the theory and experiments on plain Rayleigh–Bénard convection by setting first the theoretical frame and deriving the analytical solution of the marginal stability problem. The final chapter deals with building a bridge between chaos as studied in weakly confined systems and more advanced turbulence in the most conventional sense. This book is a valuable resource for physicists.